Its time for Indian bike enthusiast to celebrate as the Italian bike manufacturer will soon launch its big devil, Ducati Diavel in India. The recently launched Ducati Diavel is finding its way to Indian markets. With a 162bhp, 94lb/ft of torque and weight of 210kg/463lbs (dry) is adding new definition to cruisers. The bike is a muscular monster, unchained to take the roads away. It is equipped with a three mode ride by wire throtte and a slipper clutch that makes a 240-section rear. With a little more spice to the Diavel segment there is Ducati Diavel carbon variant which appoints carbon fiber bodywork with Marchesini wheels to trickle the weight down to 207kg/456lbs. 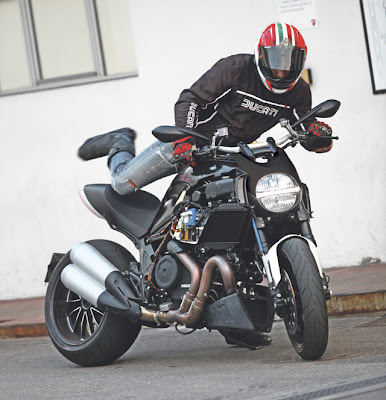 Coming to the most controversial part of the bike, the excessive bulky size and the exceptional size of the back tire, Ducati comments, “A massive 240 section rear tyre was a perfect example of how Diavel designers used a no-compromise attitude when applying their wish list of features. The sheer width of rubber communicates so much power and style that the R&D team vowed to find a way to make it handle – even if they knew the image would send a seismic shock through the industry.” Diavel is the local dialect for 'devil' and true to its name the bike gives you the feeling of the real devil unchained to show the real power. Keeping i mind the cruiser tradition, this model is accompanied with a low seat height with just 30.3 inches. Coming to the tail side of the bike, under it are placed LED taillights. The headlight is rakish with the looks similar to Monster's. The neatness in design can also be sen in the placement of license plate. Ducati Diavel is loaded with a 50mm Marzocchi USD forks which are fully adjustable. The steering lock is available at striking 70 degree. Which means that the Diavel would be maneuverable at low speeds. The rear shock is placed horizontally underneath the engine and are fully adjustable. Brembo Monoblocks breaks are used in the bike which measure 320mm front discs. The front wheel measures 3.7×17” with a 120/70-17 Pirelli but when it comes to rear it is created at a sport profile with a massive size of 8×17” rear wheel and 240×45-17 tire. 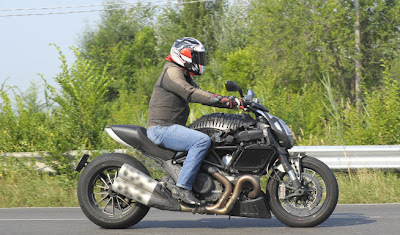 Ducati has done a real tough job on Diavel and it is evident from is looks. The review of this monter is badly awaited in Indian markets.